Sure, kitchen mishaps are legion, but some of them are solvable. Sauce too thin? Whisk in some flour. Meat underdone? Cook it longer. Underseasoned? Add spices or salt. But this is where some of us go too far to the other side, and then wind up with a situation it’s hard to come back from: The dreaded oversalting. Like the time I was making crockpot beef bourguignon for a New Year’s potluck, and the top of the salt shaker came loose, ready to ruin three pounds of meat. It was New Year’s Day, so I was not going to be able to run out and get any more beef. I immediately turned to the internet and my husband for help. The internet suggested potatoes to absorb the salt; my husband suggested keeping the meat but rinsing it off, and then starting over with a brand-new sauce. The combo worked well enough so that my new year didn’t start off with an absolute culinary disaster. But, since then, I’ve always wondered: What are the possible remedies for over-salting? Rubbing the salt off cooked steaks with a soft towel or brush may work, said Yoshi Yamada, chef of a forthcoming, yet-to-be-named Indian restaurant in Chicago. Liquids, though, are trickier, and few of the options are ideal. Depending on the dish, you might be able to add some of the base liquid —i.e., vegetable puree (for a pureed vegetable soup) or beef stock (for a beef stew)—but there are limits to how much you can dilute it before throwing the whole flavor off. Bryan Roof, executive food editor at Cook’s Country magazine, concurs that using fat can dilute some of the other flavors. If he was making a pan sauce and it was too salty, Roof said he would swirl in olive oil or butter. One thing he cautions is to avoid using acids such as lemon juice or vinegar, because those can amplify the saltiness. Roof’s best suggestion is a preventative tactic—season in increments and after every ingredient, as opposed to seasoning all at once. Let’s say you’re making a dish requiring multiple vegetables. He’ll cook the onions and add a 1/4 teaspoon of salt, then the peppers and add another 1/4 teaspoon of salt, then the green beans and another 1/4 teaspoon of salt. His reasoning is different vegetables pick up salt differently, and doing so in increments (and tasting it along the way) will ensure that all the ingredients are seasoned uniformly. Then, if you’re really desperate and up to try a not-scientifically-verified method, Eddie Lakin, owner of Edzo’s Burger Shop in Evanston, Illinois, says he’s heard that adding half a cut potato to a soup or sauce and letting it sit for half an hour may absorb some of the salinity. “I don’t know that I’ve ever done that but I’ve read it many times,” he says. Hey, desperate times have driven us to crazier home remedies. Some chefs will argue that over-salting is a mistake that can’t be rectified. Dave Beran of Dialogue in Santa Monica, California, said any means of correction will yield a sub-par dish. He uses the example of making veal jus: If you add too much salt, then try to dilute it with water, the sauce becomes too thin. And then when you reduce it back up to the proper consistency, you’re boiling the water back out, and you end up with a too-salty jus again. “Honestly, you make another batch,” Beran said. In the end, the price of over-salting is a lesson hard learned. The solution just might be: don’t do it again. 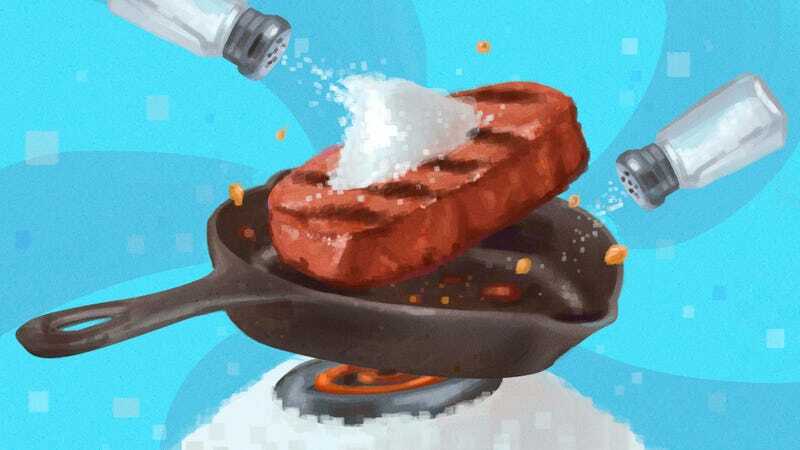 Ann Nolan, culinary training chef at World of Whirlpool, suggests some preemptive measures, such as using kosher salt rather than table salt to season—table salt is finer, which one may misjudge the amount of salt they’re adding. Tasting as you go is something all chefs are trained to do from day one of culinary school. Nolan said: “When you taste your dish for seasoning, the flavor should stay on your palate and you can taste it for a while. If your dish is not seasoned correctly, you will taste it for a second and then the flavor falls flat.” Still, “Always taste the dish at the end of cooking, you may have to add a little more salt and pepper.” Hopefully, at those final stages, you won’t be tasting too much salt; but if you do, at least now you have some possible remedy options.